What would you say is the Lewistown Public Library’s most unique collection? As the youth librarian, I would love to say that it was some wonderful nook in the youth section. Alas, most of what you would find in this Library’s youth collection is materials you could find in most other Montana libraries. However, I must stress at this most important juncture, that although we may be mildly ordinary in the youth land we still house the most amazing stories. There lies vast power in our simple familiarity. Nevertheless, our awesomeness is not entirely unique in the land of libraries. That title, resides with our Adult Non-Fiction collection, more specifically, the Local History collection. Within this assembly, peculiarities abound in such profusion they seem almost mundane. Stats time! 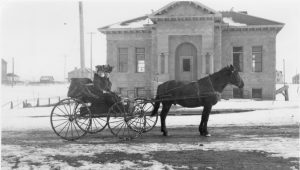 The Lewistown Public Library’s Local History collection is home to over 14,000 in-house multi-media items. A staggering 4,400 of these items can be accessed online (in the convenience of your own home) through the Montana Memory Project website. If you haven’t yet, come in and ask Nancy Watts how to navigate this behemoth of Montana history. But back to the LPL specifically, our in-house collection is made up of primary documents, books, newspapers and my personal favorite, photos. Our Local History photographic collection has over 8,400 photos and is constantly growing. A multitude of subjects are represented in this Central Montana specific collection; buildings, landscapes, portraits, and more, spanning from the early 1880’s to today, grace our shelves. Can I just say….WOW! Sadly, for all of its importance and grandeur few around the area know this collection exists in this magnitude. That is why I created a quick presentation using a few of these photographic gems that I am in-turn sharing with the school age groups that come into the library. Focusing on observation skills, I challenge the kids to critically observe the photos I present through a simple game of “I Spy.” The kids are then exposed to not only the fact that we have photos but more importantly they become aware of the history and information found within the photos themselves. If you haven’t seen this collection, on your next trip into the Library to get that James Patterson, Nora Roberts, or Rick Riordan book make sure you stop and take a moment to glance through time, it’s worth it. And it’s what makes us unique.